Be The Eyes on Your Bay! 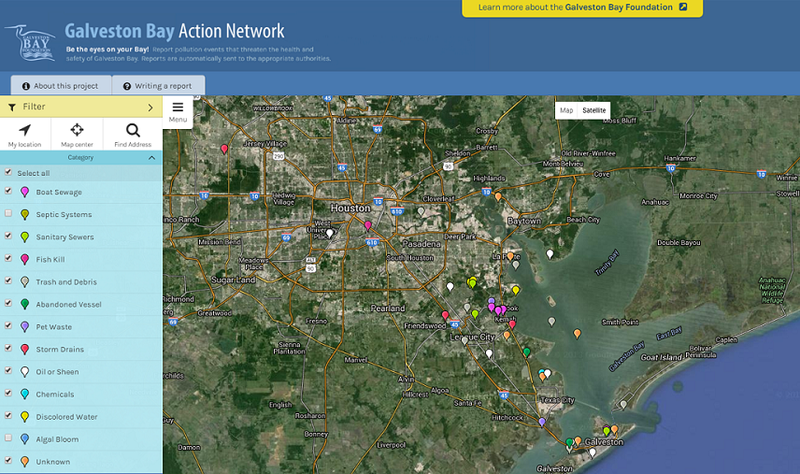 The Galveston Bay Foundation’s Galveston Bay Action Network (GBAN) is an interactive tool for submitting and viewing water-related pollution reports across the four counties that touch Galveston Bay (Brazoria, Chambers, Galveston, and Harris). It is designed to act as a bridge between citizens who care for the safety and health of the Bay and the authorities who can help enforce those qualities. GBAN pollution reports are sent directly to the appropriate authorities – no researching to find out where to send your concerns! For more information, or to view the map: Click Here! Visit Potholemapping.com for more information. On February 20th, we launched a crowd-sourced map of potholes in New Jersey where anyone can report potholes right from their smartphones. In a matter of days, 600+ potholes popped up on the map, 70% of them labeled ‘dangerous.’ Numerous media sources have picked up on our project, such as WCBS, NJ News 12, Philadelphia Business Journal, and NBC 10 News. What was proven critical about our Mappler platform in a project like this is its speed and versatility. It allowed users to upload pictures right from where they were, and made collecting and sharing meaningful information incredibly easy. Our team had already built a versatile, ready-to-use tool for any type of mapping projects, so we were able to launch NJ Pothole Map just when the road conditions were the worst after the snowstorms. Many organizations have always wanted to use interactive mapping solutions to make their data collection/visualization or public participation efforts more efficient and engaging. But hiring developers is costly and time-consuming, and advanced GIS softwares are often too complicated and expensive. We at Vertices can make this process easier and more affordable. We’ve worked with organizations across many industries to create simple, customized, and cross-platform mapping solutions tailored to each use and rolled out immediately. Talk to us today and let’s explore new possibilities through mapping. In the wake of Hurricane Sandy, residents in the affected area found themselves waiting for hours in line for gas, sometimes only to learn that they were out. In response to this problem, VERTICES President Dr. Wansoo Im and high school students from the community mapping group IMSOCIO worked together to create a community participatory map, where anyone could report on the availability of gas at stations they were visiting. We’re currently updating our project highlights page. Please check again soon!